The Onion had a typically funny post, Pretty Cute Watching Boston Residents Play Daily Game Of ‘Big City’. And what really is a major metropolis? I could go on, but you get the idea. Indeed, a variety of surveys regularly rank us as one of the most desirable places to live in the nation. A recent Business Week analysis, for instance, put Boston fourth (just behind San Francisco, Seattle, and Washington, D.C.). No wonder: Boston is green, clean, healthy, wealthy, smart, and employed. But what that means, of course, is that as a real city, we’re an utter failure. I figured the commenters would demand that he “let it go, man, it’s just The Onion.” But no, they took this all pretty seriously. If you are arguing with The Onion about whether your city is world class, you already have made The Onion’s point. I’ll say it for them. Let it go, man, it’s just The Onion. They’ll never let it go Prof. Keep in mind that Globe writers and most Globe readers are card carry members of the Clan of the Perpetually Offended at Everything. 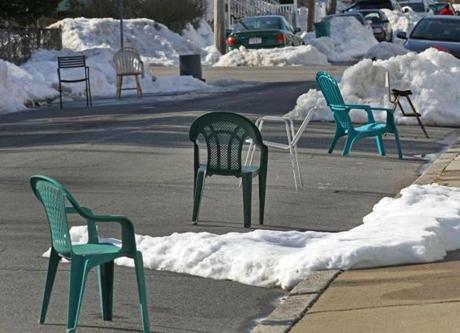 When your “residents” put out old lawn chairs and BBQ grills to “save” shoveled-out parking (“pakkin'”) spots, you ain’t no world-class city. Heh… If one really wants to get in it, Austin was a sleepy little town that you passed through traveling from Dallas to San Antonio. Now it’s a large city with small town amenities and as far as “world class” applies, tiny Providence, RI beats Austin hands down. 1. Let it go, man, it’s just The Onion. If Boston really wants to become world-class, it’s got to stop this nonsense about innovation districts, develop some outlandish new regulations, and come up with a city income tax. The lefty columnist defends Boston…using conservative criteria! 2. I figured the commenters would demand that he “let it go, man, it’s just The Onion.” But no, they took this all pretty seriously. They would. Iirc Bill Russell once wrote that Boston has more people looking for more ways to look down on each other than anywhere else he’d been. 3. While Boston still has a major concentration of intellectual capital, Rt. 128 took a hit around Y2K. Up to that time the tech industry considered itself on a par with Silicon Valley, but SV became the manifest top dog during the Internet Boom. 4. Fear not, Boston! When Betty Warren enters the Oval Office, you will become more preeminent by meeting the nation’s most urgent need: our appalling shortage of federal regulators. Not to mention the future site of the largest Cherokee owned/run casino in the world. Does Boston still have the most rude waitresses in the world? Oh please, Boston recently sent Elizabeth Warren to Washington, DC where she joined stellar representatives sent by other notable world class cities Nancy Pelosi and DiFi (San Francisco), Patty Murray (Seattle), and Eleanor Holmes Norton (Washington, DC). Anyone want to buy a newspaper? I hear the Globe’s for sale. Keane comes with it, and while you don’t have to keep him, please do, he’s part of what makes the Onion so much fun. Okay, that’s enough – let’s all go out and make up over a nice Chick-fil-A sandwich at lunch. Red Sox fans are the rudest on the planet. Need I say more about Boston? What is it with the libtards and their obsession with being “world class”? Look at the world class education system they’ve created. Funny, those are all places I would _not_ want to live. What kind of crazy criteria were being used for that “analysis”? It was at one time, Meester Globe columnist. Just ask the Piers Morgan Brigade, who/whom from what I understand, were NOT invited to a Tea Party..
Waaaht? We’re Wicked Smaht! We have the lahgest Cherokee population in New England, kid! We got Donnie Wahhhhlburg, and we got 10,000 drunk co-eds stumbling around Fanueil Hall every Saturday night. It only took us 15 years to dig some tunnels under the harbah!